At Cleanpro we take pride in helping every one of our Cleanpro professionals from all over the United States to help achieve their goals. We provide exclusive ongoing support, training and business services so you can have the confidence you are not alone with your small business. Here at Cleanpro, you're family! Cleanpro is a very unique business in that it is a carpet cleaning business that is 'eco-friendly', utilizes a scientific process that cleans carpets in a way that no one has been able to duplicate. Our process works with one of a kind technology called an Ion Exchange process. It dries in about 1-2 hours, leaves absolutely no residue, and best of all, carpets last 2-3 times longer when using our process. The results are undisputedly the most amazing results in the industry. 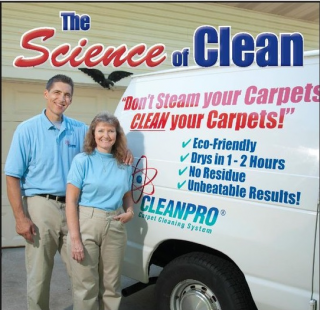 The Cleanpro Carpet Cleaning System was developed by Kevin Owsley to overcome the all too familiar problems associated with steam cleaning (hot water extraction). From inception in the late 1980's to the final refined formula in the mid 1990's, Cleanpro has continued to impress customers locally with our unique method of carpet cleaning. We began to expand in June of 1996 and are proud that our Carpet Cleaning System has provided many people with the opportunity and cutting edge needed to get an advantage in the carpet cleaning industry. We have been experiencing tremendous growth in the use of our system across the United States. For years, Cleanpro has been a valued supplier to 2 of the largest hotel chains in the world. The science and technology that Cleanpro incorporates into our specially formulated citrus-based organic cleaning solution provides the end customer with an outstanding carpet cleaning job virtually every time, especially when the carpet gets really dirty. The Cleanpro Carpet Cleaning System was designed to clean the dirtiest of carpets safely, effectively and quickly, while still using a low moisture process.